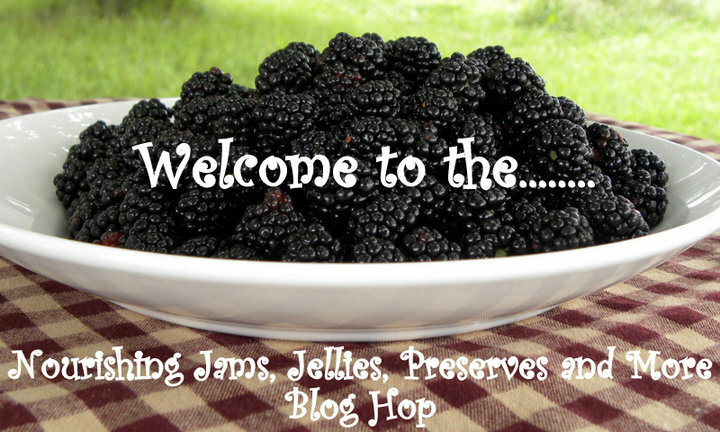 Jams, Jellies, Preserves and More - Blog Hop! Welcome to the Nourishing Jams, Jellies, Preserves and More! Blog Hop, hosted by Pamela @ Seeds of Nutrition, Diana @ A Little Bit of Spain in Iowa, and me! This blog hop starts on Friday, August 27, 2010 and extends to next Thursday, November 2, 2010. We are excited to see what you are doing to put up seasonal fruits using natural methods and natural sweeteners. We welcome you to share preservation methods, family stories, and family recipes. If you have an oldie-but-goodie buried somewhere in your blog, feel free to highlight it again in a new post which links to this blog hop. Share Your “Nourishing Jams, Jellies, Preservers and More!” Post – With Thumbnails! Bloggers, make a post on your own blog, then come back here to add your post to the linky box below. If you don't have a picture, feel free to download the picture above and upload it using the script's prompts (it is easy). Your post will appear on all three blogs! Include a link in your blog post to this post. Non-bloggers, share your family stories, family recipes, favorite recipes, or helpful tips right here in the comments! Everyone, visit and comment at the linked blogs! Tweeting and Facebooking the links you like would be great, too! If reading this via email, visit this post to see the list of linked blogs. If you'd like to display the blog hop thumbnails in your post, feel free! Click the link above that says, “Get the code here…” and follow the instructions. This may not work on all blogs — it depends on whether your blog software allows you to input scripts. Thank you so much for hosting this BlogHop! I can not wait to read all the other participants . . .
Creole Sauce – because tomatoes ARE a fruit after all! No sugar, at all, and savory! Yum! Honey-Sweetened Strawberry Freezer Jam. My *other* strawberry jam that I love! Sarah — Thanks for all the GREAT contributions! Your recipes are so good! I’m with you on the tomatoes. If I’d been able to get some, I might have added a tomato preserve. 🙂 Our tomatoes are just barely in season here. Too funny how many “favorites” you have! Reminds me of the PBS series “Lark Rise to Candleford” — have you ever seen it? One of the main characters, Dorcas, says just about everything is her “one weakness.” That’s like us and good food — everything is a favorite! We had lots of fun with blueberries this week – jam and drop biscuits and dehydrated some too! I know that this is a little late for this, but has anyone ever made banana jam? My husband brought some back from a Belize mission trip and my 4 year old loved it and is asking for it. I’d like to use natural sweetner of course. Hmmm, the LinkyTools home page is working though. If you search this site for ‘jams’ and ‘preserves’ you’ll at least see my contributions. You could do a similar search at Diana’s site (http://spain-in-iowa.com) and Pamela’s site (http://seedsofnutrition.com/).